England suffered déjà vu as they lost to Belgium for the second time this summer, this time in the third place playoff. 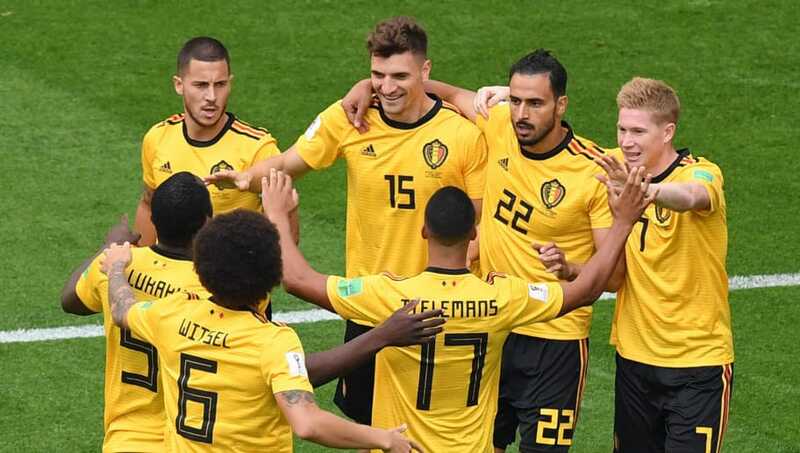 It gave Belgium the small consolation of finishing in the top three at the World Cup for the first time in their history, bettering their previous best of fourth in 1986. Both managers showed their intent by fielding strong lineups. Belgium made just two changes, bringing Thomas Meunier and Youri Tielemans into the side, while England made five changes - including a first appearance at the tournament for Phil Jones and a start for the last 16 penalty hero Eric Dier. 19 of the 22 players who started the match play their football in the ​Premier League. Third place playoffs are typically high-scoring affairs so it came as no surprise when Belgium took the lead within four minutes. They exposed England down the flanks, Nacer Chadli whipping in a perfect cross with Meunier ideally placed to poke the ball past Jordan Pickford. Belgium had England on the back foot again soon after as Romelu Lukaku charged towards the defence, but he made the wrong pass and the attack broke down. Another attack culminated with a Kevin De Bruyne shot which had the sting taken out of it, but still required a save from Pickford. More incisive play from Belgium saw De Bruyne release Lukaku, whose first touch let him down, leaving him helpless as the ball rolled through into the goalkeeper's arms. England's best chance of the half fell to exactly the man they would have wanted, as Raheem Sterling controlled the ball well and laid it off for Harry Kane, but he swiped at the ball while off-balance and skewed it harmlessly wide. A training ground corner routine ended with a Toby Alderweireld volley just over Pickford's bar as the England goal continued to lead a charmed life. Gareth Southgate's men made it to half time just one goal behind but they had offered very little to the game. Southgate showed his discontent with the first half performance by bringing on Jesse Lingard and Marcus Rashford at the break. Lingard nearly had a positive impact with a cross-come-shot which Kane was inches away connecting with at close range. In a carbon copy of a chance in the first half, De Bruyne again split the England defence with a through ball but Lukaku's touch was heavy once more and Pickford claimed gratefully. Having had the chances to win the golden boot, Lukaku's hopes were ended after an hour when Dries Mertens replaced him. England finally outsmarted the Belgian defence as Dier and Rashford exchanged passes to release the former on goal, but his chipped finish over Courtois didn't have the pace and Alderweireld was alert to clear it off the line and maintain Belgium's lead. Harry Maguire headed just wide from a Kieran Trippier free kick as England's frustrating afternoon continued. A swift break from Belgium after concerted England pressure saw beautiful link-up play between De Bruyne and Mertens before a fierce volley from Meunier was pushed away by Pickford. Belgium finally put the game to bed with nine minutes left, and it was the usual suspects who were behind it. De Bruyne once again slipped a perfectly-weighted through ball into the box and this time the final product didn't let him down, with Hazard latching onto the pass and calmly converting into the corner of the net past Pickford.